It’s been quite awhile since I have seen me some subway poster goodness here in the Garden Spot. This is because I rarely ride the subway anymore. However, last night I did and I didn’t come away disappointed. 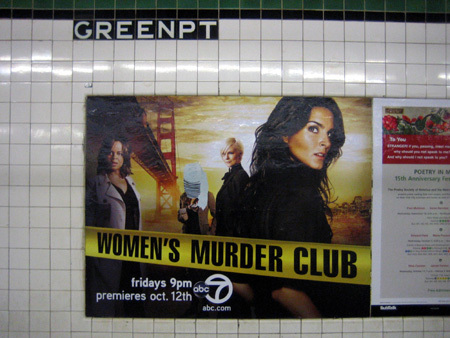 Intrigued by the hole ripped out of this poster on the Smith & 9th Street bound platform, I went in for a closer look. What is that thing saying? Oh, of course! I should have known! 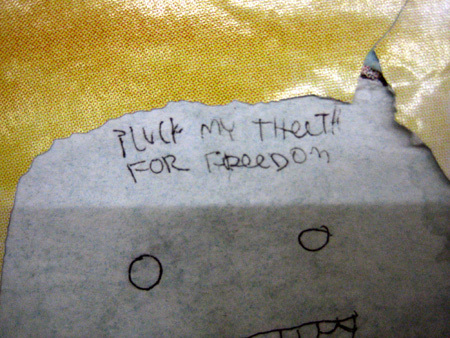 Pluck my theeth (sic) for freedom! We Greenpointers might be distrustful of a lot of things, but we pull our share of the load when it comes to protecting god and country. We may not offer up our selves (or sons) as cannon fodder for Iraq, but we pitch in all the same. Our contributions are simply of a more, uh, personal caliber. And if the smiles I see around here are any indication, we have been very generous. ohhh i love that one. 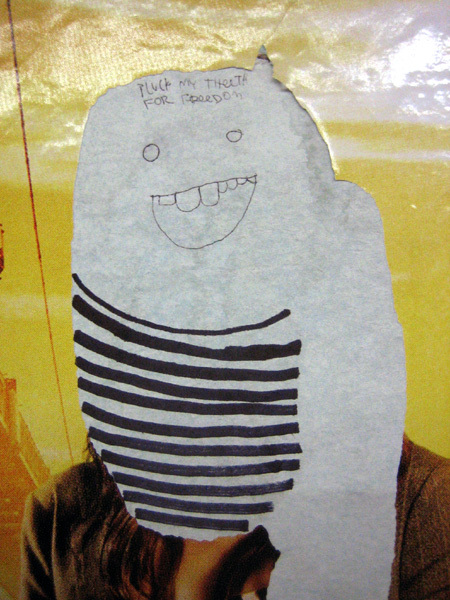 made me giggle when i saw it the other week. it’s such a cute happy little face.